The Rhine River, Europe’s premier waterway, flows from the Swiss Alps to the North Sea through Switzerland, Liechtenstein, Austria, France, Germany, and the Netherlands. Traveling along and on the Rhine River has long been popular. Europe’s premier waterway has been very important for commerce in the pre-industrial era and although the Rhine is now less vital for trade, the river is still very much used commercially. The Rhine is also very important for tourism. Boat cruises – from short day-trip excursions to multiple-day cruises – are very popular. The banks of the Rhine are also popular with hikes and cyclers while simply driving through parts of the Rhine Valley is most enjoyable too. The Rhine River is 1,320 kilometer (820 miles) from its source in Alps in Switzerland to the North Sea in the Netherlands. The Rhine River is Der Rhein in German, Rhin in French, and Die Rijn in Dutch. The Rhine River is often divided into four distinct geographical regions: the High Rhine in Switzerland, the Upper Rhine in Germany and France, the UNESCO World Heritage-listed Middle Rhine in Germany, and the Lower Rhine in Germany and the Netherlands. The origins of the Rhine River are Swiss. The source of the Rhine River is in the Swiss Alps with the two initial main tributaries are minor Alpine streams known as the Vorderrhein (Anterior Rhine) and Hinterrhein (Posterior Rhine). The Rhine flows from the Alps northwards and forms the borders between Switzerland and Liechtenstein and Switzerland and Austria on the way to the Bodensee (Lake Constance). From here, it mostly forms the border between Germany and Switzerland although both countries have small enclaves on the “wrong” side of the river. Most of the Rhine in Switzerland is known as the High Rhine (Hochrhein), especially for the section between Lake Constance (Bodensee) and the Swiss city Basel at the border with both France and Germany. It is possible to cruise from Kreuzlingen and Konstanz to Schaffhausen via Stein am Rhein and visit the nearby Rhine waterfalls (Rheinfall), Europe’s largest waterfalls. The Rhine River is navigable from the Swiss border town Basel all the way to the North Sea. The Rhine used to be one of the most important trade routes in Europe and even the present era, the Rhine is still busy with commercial traffic as boating remains a particularly cheap way of transporting heavy goods. From the Swiss city Basel past Strasbourg in France to near Karlsruhe in Germany, the Rhine River forms the border between France and Germany. Roads and important highway run parallel to the Rhine but generally not within sight of the river allowing outdoor enthusiast to enjoy the river here in relative peace and quiet. Speyer, Worms, and Mainz were very important cities during the Middle Ages. Much of their importance and wealth can be attributed to the presence of the Rhine. All three of these cities have important cathedrals. The Dom in Speyer is pure Romanesque and the largest Romanesque building in Germany. The cathedrals in Mainz and Worms are Romanesque in origin but both have strong Gothic elements too. The Neckar (with the lovely town Heidelberg) and the Main (with the commercial giant Frankfurt) are the two main contributories that help to make the Rhine a truly big river. The Middle Rhine (Mittelrhein) from Rüdesheim and Bingen to Koblenz is the Rhine of castles and myths. The Rhine Valley is here at its steepest and narrowest and a castle or castle ruins can be seen every two kilometers. During the Middle Ages, this section of Rhine was the largest source of tax income in Europe. The Middle Rhine is inscribed on the UNESCO World Heritage list. No bridges cross the Rhine between Mainz and Koblenz although car and passenger ferries are available. The Middle Rhine valley is at its steepest and the Rhine River at its narrowest at the treacherous Loreley Rock. Here, according to legend, a singing mermaid drew captains and crews to their death. Although the treacherous rapids have largely been tamed with the help of dynamite in the nineteenth century, navigating the fast-flowing Rhine here still requires skill. The Rhine is a 450 m (1,480 ft) wide, slow-flowing stream at Mainz and Wiesbaden. At the Loreley Rock the Rhine narrows to 130 m (420 ft) and flows at a rapid 10 km/h (6 mph). After the Loreley, the Rhine once again slows down and continues to flow at a more sedate pace. The Middle Rhine is the most popular part of the Rhine to visit on day trips. The best parts to see on a day-cruise excursion are the Loreley Valley between Rüdesheim / Bingen and St Goar / St Goarhausen. North of Koblenz, where the meandering Mosel (Moselle) joins the Rhine, the Rhine Valley is much wider and less spectacular. However, the Siebengebirge with the Drachenfels (Dragon Rock) near Bonn are notable exceptions and also popular for day-trip excursions from Cologne. Generally the main attractions from here northwards are cities rather than the river and nature. Cologne (Köln), with just less than a million inhabitants, is the largest city on the Rhine. The famous Kölner Dom Gothic cathedral and several Romanesque churches provide a distinct panorama that can easily be enjoyed from the Hohenzollernbrücke that spans the Rhine right next to the Hauptbahnhof. The skyline of Düsseldorf is thoroughly modern. From here, the Rhine flows through heavily populated areas including the industrially very important Ruhr region. The Rhine is particularly important for commerce from here downstream – Duisburg is the largest inland port in Europe. The Rhine River flows into the Netherlands at Emmerich. Shortly before the Rhine splits into different rivers and deltas in the Netherlands, the Rhine River’s average discharge is 2,260 cubic meter (79,823 cubic ft) per second. In the Netherlands, the flow of the Rhine has changed course throughout the centuries. Presently, the largest body of water flows down the Waal River while the Lower Rhine (Nederrijn) is a much smaller river. The Rhine itself does not make it to the North Sea anymore. A few streams still have Rijn in their names but no actual water from the present Rhine River. The Rhine is very important for tourism. 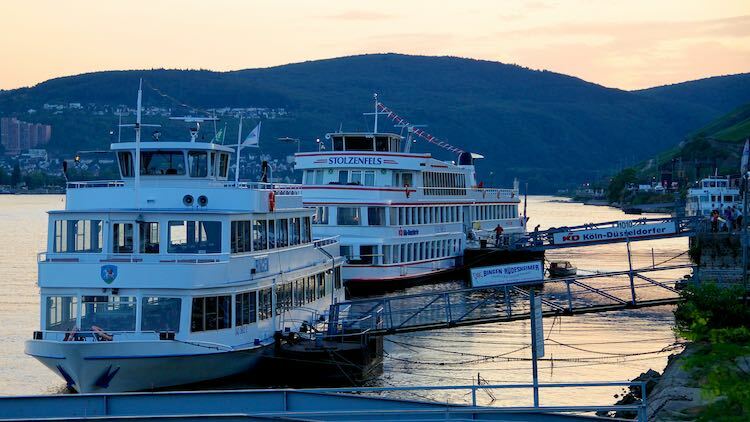 Luxury multiple-day cruises are very popular while shorter day-trip cruise excursions are particularly popular in the Loreley Valley and from Bonn near Cologne.